Manhole covers or pit lids or access covers are used to close the openings of manholes or pits in order to prevent people and unwanted materials from falling into manholes and to avoid people from injuring themselves. Manhole covers are manufactured in a variety of shapes such as circular, rectangular, etc.. Materials that are used for manufacturing manhole covers include metals (cast iron, ductile iron, and steel), concrete (conventional concrete and steel fiber reinforced concrete), and composites (FRP/GRP and others). Metal and concrete are the most widely used materials for making manhole covers. However, manhole covers made from these materials are heavy, bulky, and result in a number of occupational injuries of the personnel involved in the installation and repair of these covers. Moreover, metal covers are often stolen in a lot of areas and sold for profit. These issues are addressed by composite manhole covers as they have a high strength-to-weight ratio and have zero scrap value. They are, therefore, the emerging type of manhole covers across the world. Based on product, the global manhole covers market has been segmented into metal covers, concrete covers, and composite covers. Metal covers were the earliest type of manhole covers used. They were replaced by concrete covers, which addressed the issue of theft. However, they failed to reduce the incidence of occupational injuries. Composite covers address both of these problems. They are light in weight, offer superior strength, and a high strength-to-weight ratio. They are corrosion resistant and easy to install. Composite covers are made from recycled and reinforced resins that have a zero scrap value and are far less likely to be stolen as compared to metal covers. The composite covers segment is estimated to expand at a rapid pace during the forecast period. Composite manhole covers with their superior properties are being adopted in place of metal and concrete manhole covers. With a rise in construction activities across the globe, the manhole covers market is also expanding. The demand for composite covers is especially high and is estimated to increase at a high rate in the near future. In terms of application, the global manhole covers market has been categorized into municipal, industrial facilities, commercial facilities, utility pits, and others. Manhole covers are classified into different load classes depending on their load bearing capacity. They are used for different applications depending on the load class a particular application falls in. Areas such as airports, docks, etc. are exposed to heavy loads on the manhole covers. They use manhole covers belonging to classes E 600 or F900 that are meant for heavy loads. In terms of application, municipal is estimated to be a prominent segment of the manhole covers market globally. Utility pits is anticipated to be a rapidly expanding segment of the manhole covers market during the forecast period. Manhole covers for utility pits are required in end-use industries such as telecom, oil & gas, and chemical processing. These end-use industries are anticipated to expand during the forecast period. This, in turn, is anticipated to boost demand for manhole covers. The global population is growing at a rapid rate, which necessitates better municipal and civic amenities to serve people. With the increase in population, the construction and infrastructure industries are also expanding steadily. Increase in urban construction and construction of roads and facilities such as airports is expected to require higher use of manhole covers. Hence, growth of the construction sector offers an opportunity for the expansion of the manhole covers market. Moreover, rehabilitation of old and damaged infrastructure offers opportunities to the manhole covers market, especially in the composite covers segment. The composite covers segment is projected to expand at a significant pace in the coming years. Based on region, the global manhole covers market can be categorized into North America, Europe, Asia Pacific, Middle East & Africa, and Latin America. Europe is estimated to be a significant region of the manhole covers market. North America is another prominent region of the manhole covers market. Rise in demand for manhole covers in Europe and North America is likely to be slow as these are already mature regions of the market. Composite covers is a prominent segment of the market in Europe as composite manhole covers were adopted in the region far before their introduction in other regions. Asia Pacific and Middle East & Africa are anticipated to be rapidly expanding regions of the manhole covers market during the forecast period. Improving economic conditions in developing countries are expected to improve civic and municipal amenities. This would, in turn, increase municipal construction activities in the region, and hence, the consumption of manhole covers. Demand for manhole covers is expected to be high in the develoing countries of Asia Pacific. Economic growth in the region and expansion of end-use industries such as oil & gas, chemicals, petrochemicals, and telecom are boosting demand for manhole covers in Middle East & Africa. These regions are projected to create lucrative opportunities for manufacturers in the next few years. The composite covers segment of the market in Middle East & Africa is projected to expand at a high CAGR during the forecast period. This is because composite covers are being extensively used in a number of new construction projects in the region. The global manhole covers marker is fragmented, with a large number of local players operating in the regional markets along with some leading names. Key players profiled in the report include EJ Group Inc., Eagle Manufacturing Group, Fibrelite, Crescent Foundry, Saint-Gobain, Forecourt Solutions, Polieco Group, Ducast Factory, Terra Firma Industries, Hygrade Products Limited, Prime Composites Australia Ply Ltd., MC Pipes, and Manhole Covers Ltd.. The competition among the players is high owing to the tender-based nature of the industry. Manhole covers or pit lids or access covers are used to close the openings of manholes or pits in order to prevent people and unwanted materials from falling into manholes and to avoid people from injuring themselves. Manhole covers are manufactured in a variety of shapes such as circles, rectangles, etc.. Materials that are used for manufacturing manhole covers include metals (cast iron, ductile iron, and steel), concrete (conventional concrete and steel fiber reinforced concrete), and composites (FRP/GRP and others). Metal and concrete are the most widely used materials for making manhole covers. However, these traditionally used types are being widely replaced by composite manhole covers, which are the emerging type of manhole covers across the world. Based on product, the global manhole covers market has been segmented into metal covers, concrete covers, and composite covers. Metal covers were the earliest type of manhole covers used. Manhole covers made from metals are heavy, bulky, and result in a number of occupational injuries of personnel involved in the installation and repair of these covers. Moreover, metal covers are often stolen in a lot of areas and sold for a profit. They were replaced by concrete covers, which addressed the issue of theft. However, they failed to reduce the incidence of occupational injuries. Composite covers address both of these problems. They are light in weight, have superior strength, and a high strength-to-weight ratio. Composite covers are made from recycled and reinforced resins that have a zero scrap value and are far less likely to be stolen as compared to metal covers. The composite covers segment is estimated to expand at a rapid pace during the forecast period. In terms of application, the global manhole covers market has been segmented into municipal, industrial facilities, commercial facilities, utility pits, and others. Municipal is likely to be a prominent segment of the manhole covers market. Utility pitsis estimated to be a rapidly expanding segment of the manhole covers market in the coming years. Based on region, the global manhole covers market can be classified into North America, Europe, Asia Pacific, Middle East & Africa, and Latin America. Europe is estimated to be a significant region of the manhole covers market. North America is anticipated to be another prominent region of the manhole covers market. Asia Pacific and Middle East & Africa are projected to be rapidly expanding regions of the manhole covers market during the forecast period. The report analyzes and forecasts the manhole covers market at the global and regional levels. The market has been forecast in terms of revenue (US$ Mn) from 2018 to 2026. The study includes drivers and restraints for the global manhole covers market. It also covers the impact of these drivers and restraints on the demand for manhole covers during the forecast period. The report also highlights expansion opportunities for the manhole covers market at the global and regional levels. The report comprises a detailed value chain analysis, which provides a comprehensive view of the global manhole covers market. Porter’s five forces model for the manhole covers market has also been included to help understand the competition landscape. The study encompasses market attractiveness analysis, wherein the application and product segments have been benchmarked based on their market size, growth rate, and general attractiveness. 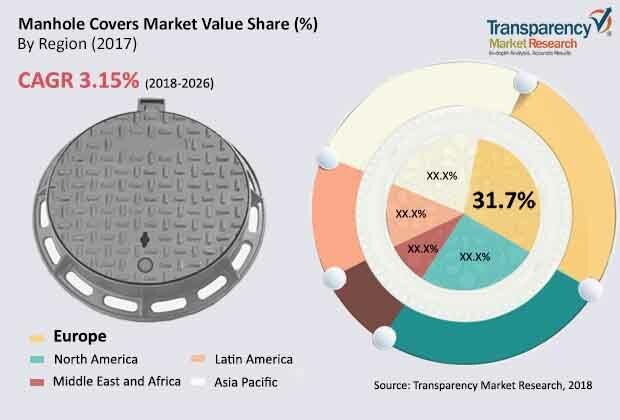 The study provides a decisive view of the global manhole covers market by segmenting it in terms of product, application, and region. These segments have been analyzed based on present and future trends. Regional segmentation includes current and future demand for manhole covers in North America, Europe, Asia Pacific, Latin America, and Middle East & Africa. The report also covers the markets for individual products and applications of manhole covers in all the regions. The study includes profiles of major companies operating in the global manhole covers market. Key players profiled in the report include EJ Group Inc., Eagle Manufacturing Group, Fibrelite, Crescent Foundry, Saint-Gobain, Forecourt Solutions, Polieco Group, Ducast Factory, Terra Firma Industries, Hygrade Products Limited, Prime Composites Australia Ply Ltd., MC Pipes, and Manhole Covers Ltd.. Market players have been profiled in terms of company overview and recent developments. The report provides the estimated market size of the global manhole covers market for 2017 and forecast for the next nine years. The size of the global manhole covers market has been provided in terms of revenue. Market numbers have been estimated based on product, application, and region. Market size and forecast for each product and application segments have been provided for the global and regional markets. Market numbers for composite manhole covers in various applications have been provided for regional markets.